Mac Pro vs. PowerMac: How much faster is it? Anandtech took the Mac Pro through their exhaustive hardware review process, then compared it to the old PowerMac to see just how much added improvement the switch to Intel made. The results? It's definitely faster as long as you're not using Rosetta to run non-universal binary applications. 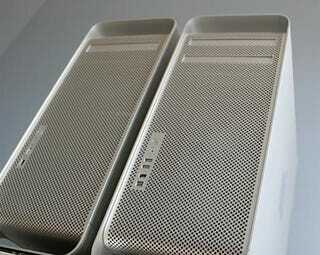 On the inside, assembly-wise, the Mac Pro has many advantages over the PowerMac. There are four very easily accessible SATA hard drive sliders to add more storage. The RAM and PCI-E cards are both also very easy to get to when you have to make upgrades. Definitely an improvement over the PowerMac. There's also plenty more USB 2.0 and Firewire ports on the outside for external connectivity—again, one of the complaints about the PowerMac. So how does it perform? Well, as long as the application was running natively with Intel universal binary code, everything was fine. As soon as you get to Photoshop or the Microsoft Office applications, things start to go slow. Keep this in mind as you make your purchase. If these are part of your daily must-use apps, you may want to stay with a PowerMac for now. Overall, the Quad-Core (two processors, each dual core) made most applications faster than on the Powermac. Occasionally, when some applications are single threaded, the four cores didn't help much, because you can't split up the threads (tasks) among the cores. Think of it as four guys trying to drink out of one gallon of milk out of the container. If the application were multi-threaded, it'd be like four guys drinking the same gallon of milk that's poured out into four glasses. One thing Anandtech did find was that the FB-DIMM memory had a pretty steep performance cost. It's a bit technical and dry, so you should head over there if you want to get the nitty gritty. All in all, this is a pretty powerful machine that's actually the same price as a home-built config of the same specs, and cheaper than a comparable Dell machine. Really!